Trump National Security advisor Carter Page testified last week before the House Intelligence Committee. That transcript was released yesterday, and is now being analyzed. Why it’s relevant: I maintain that gigantic motivator for the Russian attack on America has been the rapidly developing Carbon Bubble, and a global turn from fossil fuels. Above, Chris Mathews states the case succinctly. The “Steele Memo” is the dossier compiled by former MI6 agent Christopher Steele, which Trump/Russia, which outlines extensive Trump campaign ties to the Putin Oligarchy. As the aggressive investigation by Special Prosecutor and Former CIA Chief Robert Mueller presses forward, and new details emerge, more and more of the memo assertions have been verified. President Trump has called the memo a “hoax”. The House Intelligence Committee released a transcript of former Trump campaign adviser Carter Page’s testimony before the panel last week. Some of the testimony supports details contained in what’s become known as the Steele dossier. Page revealed that he had met with Russian government officials and a top official at a state-owned oil giant during a 2016 trip to Moscow. The House Intelligence Committee on Monday released the full transcript of former Trump campaign adviser Carter Page’s testimony before the panel last week, portions of which support details in an explosive collection of memos outlining alleged collusion between the campaign and Moscow during the election. 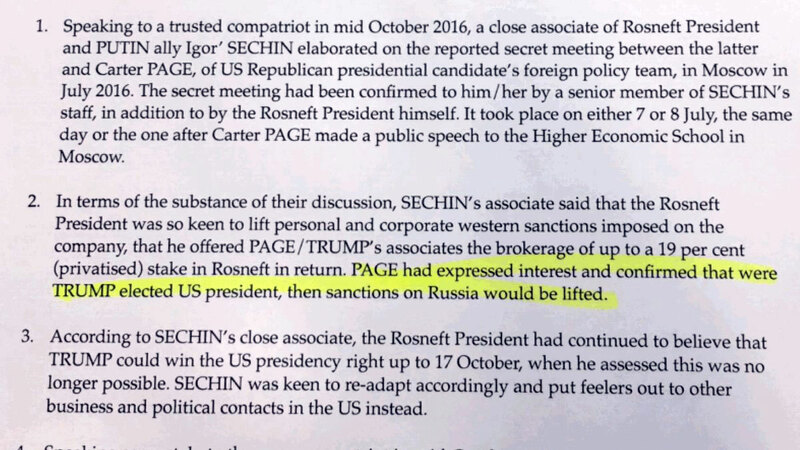 Page revealed during his testimony that he met with both members of Russia’s presidential administration and with the head of investor relations at the state-owned Russian oil giant Rosneft during his trip to Moscow last July. He also congratulated members of the Trump campaign’s foreign policy team on July 14 for their “excellent work” on the “Ukraine amendment” — a reference to the Trump campaign’s decision to “intervene” to water down a proposed amendment to the GOP’s Ukraine platform. The original amendment proposed that the GOP commit to sending “lethal weapons” to the Ukrainian army to fend off Russian aggression. But it was ultimately altered to say “provide appropriate assistance” before it was included in the party’s official platform. The dossier alleges that the campaign “agreed to sideline” the issue of Russia’s invasion of Crimea and interference in eastern Ukraine in exchange for dirt on Hillary Clinton. Page also revealed that Trump campaign adviser Sam Clovis had asked him to sign a non-disclosure agreement upon joining the campaign — and that he discussed his July Moscow trip with Clovis both before he went and after he returned. The question of collusion is at the heart of the various investigations into links between Trump and Moscow. Even a senior Republican, Richard Burr, the chairman of the Senate intelligence committee, admitted this week it was an open question. Burr said his committee needed to talk Steele himself to assess the dossier properly and urged him to speak to its members or staff. According to an NBC report on Friday, Steele had expressed willingness to meet the committee’s leaders. In his remarks this week, Burr said his committee had come to a consensus in supporting the conclusions of a US intelligence community assessment in January this year that Russian had conducted a multi-pronged campaign to interfere in the 2016 election, in Trump’s favour. It is a finding that echoes the reports that Steele was producing seven months earlier. Trump has called the assessment a “hoax”, but there is no sign the three agencies that came to that conclusion, the CIA, FBI and NSA, have had any second thoughts in the intervening months. “Many of my former CIA colleagues have taken [the Steele] reports seriously since they were first published,” wrote John Sipher, a former senior officer in the CIA’s National Clandestine Service on the Just Security website. Only one vote so far in “rate this”—-a single star for “very poor”, and undoubtedly given by DweebyJ or one of the other Russian trolls. It will rise to 2-1/2 stars after I give it a vote of five stars—-“excellent”. Note too that my comment here will soon have a feeble thumbs down or two from the trolls as well. The net closes around the fish—-they will soon be lifted wiggling and gasping out of the swamp waters. Here is the trailer for the final episode of the ONLY season of “The Trump Administration”. While many of us might enjoy the earlier probability of Trump being removed from office, the best-case remotely plausible scenario leaves us with President Pence (the man who said that Christians are more persecuted than Jews), who seems to have a deep faith-based disbelief in AGW. Yes, having a President Pence would still involve a cruise on the River Styx on a leaky boat, but I find it hard to believe that Pence could do more damage to the country and the planet than the Demented Orange Menace (who is now in the Far East with THREE carrier groups and talking about having a “surprise” for the world). Actually, I’m hoping that when we remove Trump, we can somehow jump down the line of succession until we get to Mattis. Pence has his own issues and he will just have to wait his turn under the spotlight.